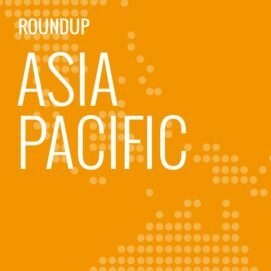 In this weekly segment, ExchangeWire sum up key industry updates on ad tech from around the Asia-Pacific region – and in this edition: Australia online ad spend up 7.2%; Singapore Tourism tap Tencent ad platforms; Singapore SMBs offered help in marketing; MediaMath eye South Korea growth via local reseller; AdAsia mull possible listing in Hong Kong; Postr ring in Indonesia; and RTB House open in ANZ. Australia’s online ad spend grew 7.2% year-on-year to reach AUD$1.86bn (£1.08bn) in the first quarter of 2017; although this figure was 5.8% lower than the previous quarter. Classified grew 7.1% over the previous quarter and saw the highest year-on-year growth of 15.9% in the first quarter, according to the latest IAB PwC Online Ad Expenditure Report, which included revenue from agencies and direct advertisers. There was growth across all categories year-on-year, with search clocking a 6% increase and display climbing 4.5%. Automotive brands led digital display ad spend, accounting for 20.3% of this segment, while travel grew its share 6.4% over the previous quarter. Mobile ad spend grew 29% to AUD$653m (£379.34m) in the first quarter, but dropped 1% over the previous quarter. It accounted for 53% of the overall display market, growing significantly from just 21.5% three years ago. Video contributed 36.3% of display ads, up 11% from three years ago, with FMCG and retail leading the pack to account for 30% of total video ad spend. In comparison, the real estate brand category, which accounted for 12.1% of overall display spend, had yet to fully embrace video ads, according to IAB. 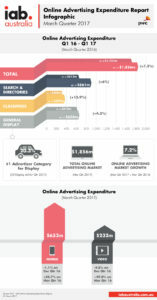 IAB Australia CEO Vijay Solanki said: “The online advertising marketing continues to surpass historical year-on-year figures across all categories. Significantly, mobile continues on its steep growth trajectory, further increasing its share of general display advertising both quarter-on-quarter and year-on-year. “This speaks to both the ubiquity of smartphones within Australia and improved mobile advertising technology and creative, as brands better understand the challenges and opportunities the platform offers”, Solanki added. Singapore is looking to lure Chinese tourists to the city-state and promote local services via Tencent’s targeting and analytics tools. Singapore Tourism Board (STB) signed a Memorandum of Understanding (MOU) with Tencent’s international business group to promote Singapore as a destination of choice and enable local merchants to deliver richer visitor experience for Chinese travellers. Tencent’s advertising and marketing tools would allow STB to grow consumer awareness in China as well as engage Chinese consumers during their stay in Singapore, said Poshu Yeung, the Chinese vendor’s vice president of international business group. There also would be opportunities for local partners to target Chinese consumers by tapping Tencent’s products, such as the company’s WeChat messaging and cross-border payment platforms, cloud, and advertising tools, Yeung said. Its ad portfolio included WeChat Moments Ad, which featured native social-feed display ads. Pointing to China as an ‘important tourism’ market, STB’s chief executive Lionel Yeo said: “At STB, we have been growing our digital footprint in efforts to engage digital-savvy Chinese consumers through various partnerships – from attracting them to visit Singapore, to delivering an enhanced visitor experience while in Singapore, and to encourage the sharing of experiences post-trip. “The partnership will enable us to reach our targeted segments in even more agile and effective ways through Tencent’s big data and multiple platforms”, Yeo said. Under the MOU, Tencent would analyse user trends to help STB better understand Chinese visitors so they could identify more effective ways to build brand awareness and product familiarity before Chinese travellers arrive in Singapore. Targeted ads also could be rolled out to reach these visitors while they were in the city-state. Singapore small and midsize businesses (SMBs) have been offered a helping hand with access to free online marketing space and training. Singtel and DBS Bank this year beefed up their annual 99%SME initiative, first launched in 2015, to allow 5,000 SMBs to market their products and services on the 99%SME website for free. This was double the targeted number last year. Media partner Mediacorp also would offer three ad packages, worth S$100,000 (£56,592) each, to the top three SMBs that received the most number of likes on the local broadcaster’s Toggle digital entertainment service. In addition, Singtel launched their cloud-based application, Adtiq, which was touted to enable SMBs to plan, create, and optimise their ad campaigns across multiple digital platforms. The vendor also partnered with Google to provide training for 1,000 SMBs to help these companies use digital marketing tools, including Adtiq, which was developed together with Singtel’s digital marketing subsidiary, Amobee. The programmatic marketing platform has launched their operations in South Korea, appointing Wishmedia as their official reseller for the market. Citing figures from Magna Global, MediaMath said the South Korean market in 2014 clocked USD$237m (£184.98m) in programmatic spend and was projected to be the largest RTB market by 2018. The launch pushed the ad tech vendor’s global operations up to 43 countries and followed others in the region, including Singapore, Tokyo, India, and Australia, over the past three years. Apart from being the official reseller of Mediamath’s programmatic platform, Wishmedia also would be responsible for all sales outreach and campaign management for MediaMath’s clientele in South Korea. The ad tech vendor has opened an office in Hong Kong, from which they would be aiming to expand their East Asian operations and are exploring plans to list on the Hong Kong Stock Exchange. Headquartered in Singapore, AdAsia Holdings had operations in eight other countries. Their co-founder and COO Otohiko Kozutsumi said: “We are looking at a well-connected populace with 85% of the population already connected to the internet. Social media is also growing in popularity, with three-quarters of the population already engaged with a social media platform with a positive year-on-year adoption rate. “Our move into Hong Kong seeks to leverage these trends, providing marketers and publishers greater means to increase returns,” Kozutsumi said. 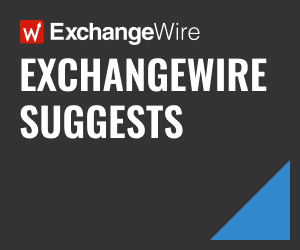 AdAsia CEO and co-founder Kosuke Sogo added that the company was aiming for a public listing within the next two years and had identified the stock exchanges of Hong Kong or Japan “as the most ideal environments”. The New Zealand-based ad tech vendor has unveiled their launcher app Aladin in Indonesia, delivering personalised deals to mobile customers of local operator Hutchinson 3 Indonesia (H3I). These mobile users would enjoy sponsored mobile data from the telco in return for receiving the customised offers on their Android lock screens. Postr’s local partner and systems integrator, AQN, was responsible for managing their business development, technical support, and integration work as well as direct ad sales for Aladin. Reinartz added that sponsored ad content was targeted to individual mobile consumers, who then could choose whether to engage with the content or not, and still receive sponsored data regardless. The ad retargeting vendor has launched in Australia and New Zealand, where they would be looking to ride the market’s growing programmatic adoption. Some 63% of Australian digital ad inventory across all devices currently was purchased through programmatic or ad network services, said RTB House, citing stats from Pathmatics Nielsen. This offered an increasing opportunity for the vendor to set up their business infrastructure in Australia and New Zealand, they said. The local operations would be led by country director Steve McMahon, who was previously responsible for sales at Criteo ANZ. “Our entry into Australia and New Zealand is a big step for RTB House in expanding our global presence, especially in the Asia-Pacific region”, said Asia-Pacific managing director Jakub Ratajczak, noting that the new outfit marked the company’s sixth in the region, which also included Singapore, Indonesia, and Taiwan.